464 pages | 3 B/W Illus. This timely survey will be essential reading for scholars and students of Democratization and Asian Politics, as well as policymakers concerned with democracy’s setbacks in Southeast Asia and the implications for the region’s citizens. "Overall, the editor has organized a good review of a complex and diverse region. There are bibliographic references in each chapter. Summing Up: Recommended. Upper-division undergraduates and above." William Case is professor in Asian and International Relations and former director of the Southeast Asia Research Centre at City University of Hong Kong. He has held teaching or visiting research positions at the University of Malaya in Kuala Lumpur, Malaysia, the National University of Malaysia, the University (Institute) MARA in Shah Alam, Malaysia, Chulalongkorn University in Bangkok, Thailand, and the Centre for Strategies and International Studies in Jakarta, Indonesia. 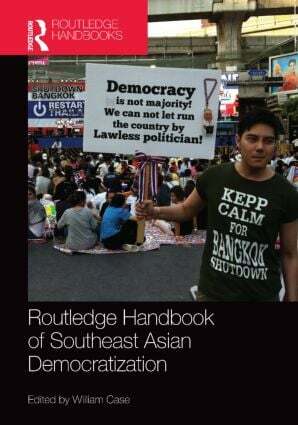 His most recent book is Contemporary Authoritarianism in Southeast Asia.